If you’ve ever been to the FedEx Forum, a.k.a. the Grindhouse, for a Memphis Grizzlies game, you may have noticed a certain sound that seems to cut through the roar of thousands of Grizz faithful. That sound is the signature whistle of Head Coach Lionel Hollins. Hollins says the whistle came naturally – he brought it out at his first assistant coaching gig and his kids know it by heart. 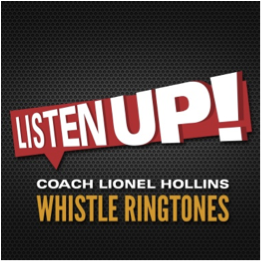 So, now any Grizzlies fan can have Coach Hollins’ famous whistle immortalized in ringtone format, which is available for download via CoachHollins.com (or iTunes) for iPhone and Android, in full-length 30 second and 5-second alert tone versions. Royalties from the ringtone sales benefit the Lionel Hollins Charities, whose mission is to provide resources and meaningful relationships to inner city students and their families. It all started after Ward Archer (of Archer Records and Music+Arts Studio in Cooper Young) approached Hollins after a game last season about the idea. Soon after, the coach hit the studio to record. Add an arena-style beat courtesy of Roy Berry and Rick Steff (Lucero) and some of Coach’s signature phrases and you’ve got a must-have for any Grizzlies fan. And now, as part of an ongoing video campaign, Memphians all around the city are getting the call to show their support of Coach Hollins and the Grizzlies, including former American Idol Finalist Keia Johnson, beloved bartender and musician Billie Worley, graphic designer Brian Dixon, renowned bassist David Parks and Beale Street’s own Memphis Jones. And now it seems Eric Mathews, Executive Director of Memphis’ entrepreneurial incubator EmergeMemphis, has gotten the call. You can find out who’ll be next to #getthecall by following the whistle on Twitter (@HollinsWhistle) and YouTube (YouTube.com/HollinsWhistle).